Is it too early to assign gender stereotypes to gadgets? 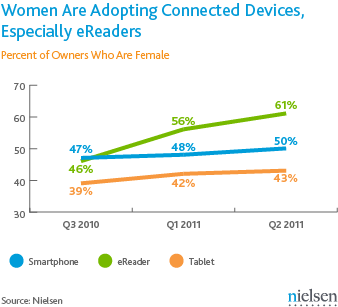 New Nielsen data suggests that e-readers are more popular with women while guys prefer their tablets. Smartphones are now equally popular between the sexes. According to Nielsen’s second-quarter survey, 61 percent of e-reader owners are women, up from 46 percent in the third quarter of last year. Meanwhile, men make up 57 percent of tablet owners, which is down from 61 percent in the third quarter. Smartphones are used equally by women and men. It’s still early in the growth of both tablets and e-readers, so there’s no telling if the skew will balance out over time. As time goes on and sales pick up, it’s likely we’ll see some more settling. But it’s still interesting to see these gender differences and what seems to be popular with each group, especially as e-readers have shifted to becoming more popular with women. Does this confirm that women like book reading more, as research suggests, or do they just prefer a lighter device or perhaps a simpler, single-purpose gadget? And do guys just want more horsepower and complexity, or do they prefer more games? I’d be interested to hear your theories. Nielsen also found that the demographics of tablet and e-reader owners are shifting, bringing in more older users. Tablet owners 45 and older used to be 23 percent of users in the third quarter last year but now constitute 37 percent of owners. 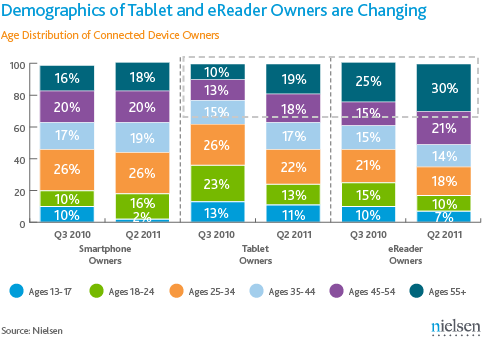 Owners of e-readers 45 and older used to be 40 percent of all owners in the third quarter and now represent 51 percent. The numbers show that tablets and e-readers are appealing to older users now while their popularity with younger users appears to be sliding. Again, it’s still early in the life cycle of both tablets and e-readers, and so we’re going to see a lot of shifts over time as more groups find utility in these products. I love my Nook. I do think it is a complete bother that all the different E-readers have different formats so you can really only buy from whichever company you get the reader from unless you want to spend time fooling around with format translators trying to get you book purchase readable. It is simple, women read more because then they are not forced to look at the world through male eyes. Even with a TV show that has been based on a book like Trueblood is based on the Sookie Stackhouse adventures, once you take a fun story,run it through male screen writers, male casting couch jockeys, male directors, male producers, male editors and male ad buyers the characters and especially the women are not recognizable. Women read because they don’t find looking at the world through the distorted vision of men rewarding. I agree with Noa that 57% and 61% isn’t much of a difference… BUT my husband and I have beb having this same conversation recently, so it’s interesting that we’re not alone. I would prefer an ebook reader because it’s compact, it has a dedicated purpose, and has nifty functions. I don’t need another device for playing games, checking FB, or anything else a tablet can do. I’ve aleady got a laptop and a phone. An eReader would simply replace the book that I generally carry in my bag. My husband would prefer a tablet, because it has multiple functions. If you’re going to go to the effort to carry an electronic device with you, why wouldn’t you want it to have as much functionality as possible? Plus, he loves to flick between things, so he can read for a bit, then check FB, watch a bit of movie, p[lay a game, go back to reading, all within the space of 20 minutes without needing to change devices. I think it’s just a different perspective on “value” and “ease of use”. I Have had various laptops since ’91 and have a netbook and a smart phone. It seemed to me buying a tablet was too much of a duplication of what I already have so bought Nook Color which I love and can surf the web and get email what more do I need! By the way I am 67 and female and have always been interested in technology. This is yet another example how so called “gender differences” are blown out of proportion. 57% vs. 61%? Give me a break. Also, your “theory” that women prefer simpler gadgets and men like horsepower – are we in the middle ages? I’m a woman and I like my gadgets with horse power and complexity just as much as the next guy. I think the reason why the younger demographic isn’t buying tablets as much – yet – is cost. They simply cost too much right now. I would love to know the demographic numbers on the TouchPad when it went for $99. Well, for my wife – she motly uses her iphone, but using the kindle app almost exclusivly. She does not use iBooks, as there is no local asia pacific store for iBooks, and she has no interest at all in finding other sources of books in open epub or pdf formats. She would broably be happy to buy a kindle reader and only buy kindle DRM encrusted content. But she has said she doesnt want to waste money on a single funtion device. For myself, I use my ipad and iphone, and occasionally my laptop, with kindle, stanza and ibooks. I converted much olf my old collection of txt files and pdfs into ebpub using Calibre, and I mail these to myself and usually read them in ibooks. Kindle is used for the kindle content of course, and I have stanza as well, but I dont use it for much. Tolerance for complexity differentiates us much more than our reading preference. I own a tablet and my girlfriend owns an e-reader. I started looking at tablets initially because few e-readers come with built in backlights, and I like reading in the dark. But then it became about the horsepower… being able to watch Netflix and movies or control my computer remotely. My girlfriend likes her Nook Touch because it doesn’t way anything and is very small. I like my ereader BECAUSE it doesn’t do anything but let me read books. If I had an ipad I wouldn’t use it for books, I would get distracted by games and facebook and everything. When I want to read, I just want to read without the temptation of the internet. You could pretty much infer this from both the bestseller lists for ebook titles, and what’s on offer for free as promotions. There is never a good time to assign gender stereotypes. I think this is just another example of how men seem to typically be the early adopters for tech gadgets. I don’t consider e-readers techy or a gadget, it’s just a digital way to read book. Tablets, on the other hand, are our latest gadget all-star. I disagree. This isn’t about what is or isn’t a gadget (but seriously, you think a Wi-Fi enabled device that lets you buy and read books instantly isn’t a gadget??) but more about how technology meets a need or passion. Women are voracious readers – especially of novels – men, less so. No wonder a technology aimed squarely at that behaviour is doing so well with women.